Machined aluminum replacement for the factory barrel band on a 10/22 carbine offers an integral sling loop and two Weaver-style accessory rails. Accepts slings up to 1 1/4" wide, and reversible design lets you install it with the sling loop on either side of the rifle. One-slot side rail and a two-slot bottom rail let you mount lights, lasers, or other items. Won't interfere with factory front sight. 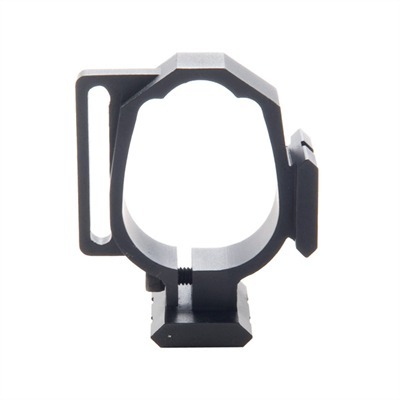 Mfg: Pro Mag SPECS: 6061 T6 aluminum, hardcoat anodized, black. 1 1/4" (3.2cm) long, 2" (5cm) wide, 2 1/4" (5.7cm) high. 1.3 oz. (37g) weight.